This just in, this news is fresh off the press. The seemingly dormant record label, Elektra Records has awaken and chosen to compose a new lineup of artists for their re-awakening. Elektra Records has been the home of some of the most famous and influential acts in music history, such as the Doors, the Eagles, and Phish; and has also made releases for such modern artists as Bjork. Elektra Records has been inactive for the past 5 years, which gives wonder to why such a new spur of artists have arisen. brand spankin new acts on the lineup. Which is a MAJOR DEAL. This means that Elektra Records will be in charge and sole exclusivity of Justice’s sophomore album which the entire world has been heavily anticipating since 2007’s †. Along side the boys on the lineup will also be such incredible acts as Little Boots, and Cee-Lo Green of Gnarls Barkley. Does this mean that Justice are sell outs? I see you guys had a scooop in this one, great! It's rather sad news I'm afraid...let's hope the Ed Banger Team can be enforced with some new & talented djs + producers soon. 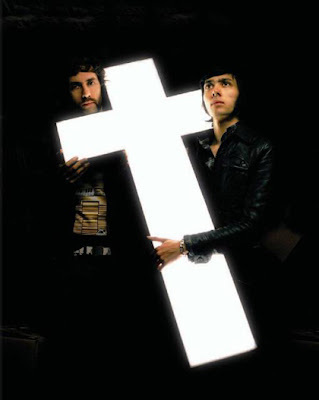 Justice's joining Elektra does not necessarily mean they're no longer Headbangers. They still call themselves as such on virtually every website related to them (even the Elektra webpage), so Elektra may just be a new distributor. Yeah this is what we originally proposed. I offered the Kitsune label example. It could be a joint distribution, but no camps have offered any word.